It turns out that if you suggest to Mister Monkey that you would be interested in reading a book about Australian Aborigines, he thinks you should read Bruce Chatwin's The Songlines. He is not alone. I'm here to tell you, however, that if you read this book because you want to learn about Aboriginal culture, you'll be disappointed. If, on the other hand, you are reading it because you want to read a book in which a man tries very hard to make sense of the living conditions of some people who refuse to fit in with the reality that's been forced upon them, and also tries to construct a grand theory of travelling, you will be enlightened and find much enjoyment. The book, which was written in 1987, tells the story of Chatwin's attempt to learn about Aboriginal songlines by going to Australia and meeting with leaders of Aboriginal groups. During his stay, he is trapped by bad weather on a reservation for some time and goes through his notebooks to try, it seems to me, to come up with an explanation for why people like walking, and why people (in particular Westerners) seem to be so hell-bent on forcing their realities onto other cultures. 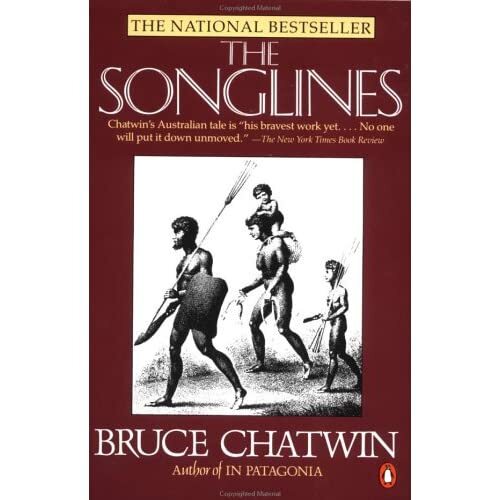 Originally when I was reading this, I tried to explain away these disjointed fragments of personal recollection and anthropological theory as Chatwin's attempt to sing his own songline, but now I'm not sure. I could imagine that you would, having spent time in the company of Aborigines, try to construct a romantic history of your own. Who is not seduced by the idea of these people, living the same way for 20,000 years, living through songs and stories and hunting and taking only what they need from the land around them? You'd have to be a hard person not to fall in love with words and concepts like Dreamtime and Dreaming, or the idea of having your own songline. Of course you'd love to have something like that for yourself. I have to conclude, though, that it really was a grand theory of walking he was after in the muddled middle section of the book. The ever-useful Queenie, who has read Nicholas Shakespeare's biography of Chatwin, told me that Chatwin wrestled with that section of the book for over a year, and finally had to let it go as it was because he couldn't hammer it all into a single coherent strand. I think, if you read Jared Diamond, you might find some of the legacy of Chatwin's attempts in there. Outside the section on walking and travelling, Chatwin's own experience in Australia are amazing. I won't tell you any of them, but if you ever read about the romance of kangaroo hunting and think "I'd like to do that", I think you'll be surprised to see what's changed about it. By the way, I would still like to read a comprehensive book about the Aborigines, if anyone knows one. If you find such a book, let me know about it. I have the suspicion that all common knowledge about the Aborigines is either false or some kind of crass generalisation from some people who lived in one place to all dwellers on the continent. I mean, Australia is very big - so would all Aborigines have the same concept of the Dreamtime and so on? That would be kind of bizarre. Well, as I understand it, the territory of Aboriginal peoples overlapped hugely, so I suppose it does make sense that they would have invented an overarching mythology that would prevent tribal warfare from breaking out. However, I'm not clear on this at all.